Valora — brightens up your journey. Each and every day, around 15 000 employees in the Valora network work to brighten up their customers’ journey with a comprehensive convenience and food offering – nearby, quick, convenient and fresh. The around 2 800 small-scale points of sale of Valora are located at highly frequented sites in Switzerland, Germany, Austria, Luxembourg and the Netherlands. 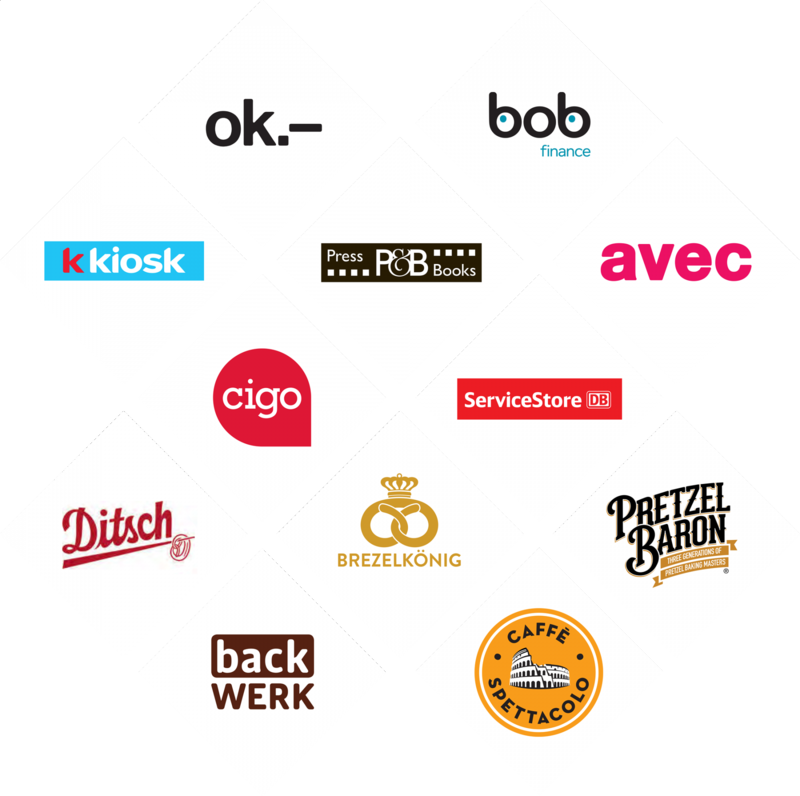 The company includes, among others, k kiosk, Brezelkönig, BackWerk, Ditsch, Press & Books, avec, Caffè Spettacolo and the popular own brand ok.– as well as a continuously growing range of digital services. Valora is also one of the world’s leading producers of pretzels and benefits from a well-integrated value chain in the area of baked goods. — We make our customers happy. — We combine flexibility with foresight. — We are uncomplicated and take decisions efficiently. — We give space for ideas. We offer the best food and convenience concepts based on: an in-depth understanding of customers and formats, operational excellence, ongoing innovation and agility as well as optimal value creation. Valora operates a dense network of small-scale retail formats at heavily frequented sites and transport hubs. The stores offer kiosk and convenience products with a growing share of food and services as well as strong own brands. Through its modern network of sales outlets, Valora offers products of high quality for out-of-home consumption to a broad customer base. It also produces pretzels and other bakery products for its own formats and international third-party customers in four production facilities. 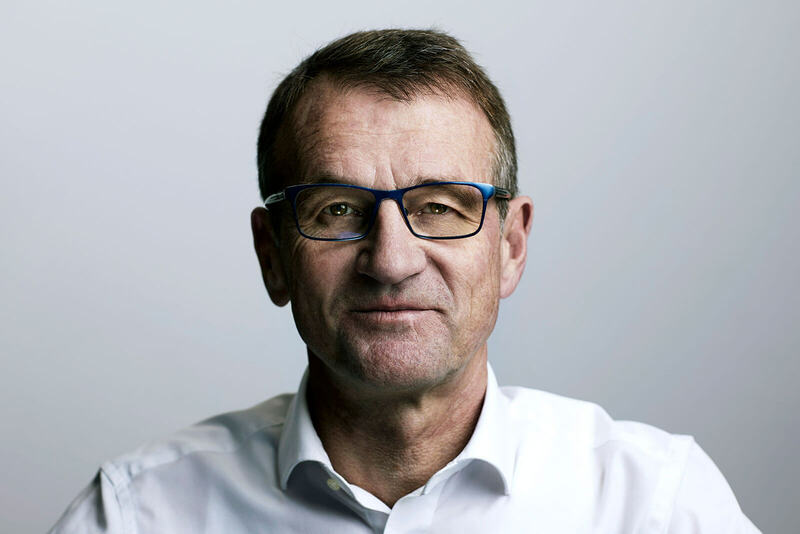 With EBIT of CHF 89.8 million and an EBIT margin of 4.2 %, we once again met the communicated expectations in 2018. This result was mainly supported by the encouraging operating performance of Retail and Food Service in Switzerland and the solid performance of the Food Service division as a whole – in spite of the accelerated decline in the print media business in Germany and high project costs. Apart from the excellent operating performance, 2018 was dominated by the consistent alignment of various sales formats to the latest customer needs. Within just a short space of time, the new management team in Switzerland modernised all retail formats in Switzerland. The new avec concept has already been rolled out successfully, with the focus falling on the most modern foodvenience. The figures for the first time include a full year’s contribution by BackWerk, the food service format acquired in 2017 which we continued to expand further. We also posted strong same-store growth for our Food Service sales formats. Retail CH developed well as regards same-store business and in the second half managed to keep the number of sales outlets stable for the first time in a while. Our pretzel production facilities were working at full capacity and we are progressing well with the required expansion of our production capacity. With the new organisational structure which entered into force on 1 January 2019, Valora is even better prepared for the future. The organisation is structured into the two market and customer-focused Retail and Food Service divisions and Group-wide Shared Services. The new structure allows us to better capture synergies and ensures that expertise is spread throughout the Group. This includes the area of digital innovation, which is now the direct responsibility of the CEO. Valora has made further progress with digitalisation and innovation, both of which are permanent tasks. We offer novel digital services and make use of the latest new technologies to create unique shopping experiences. 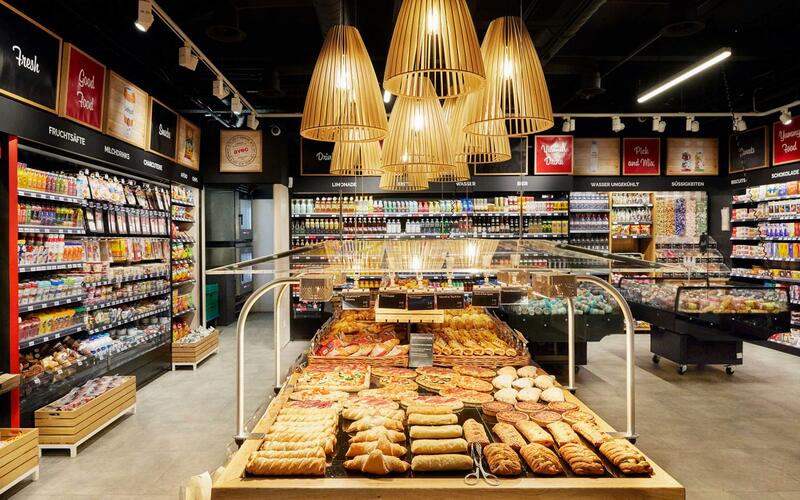 In spring 2019, Valora will launch the new avec box, a cashier-free convenience store that can be operated around the clock, as well as avec X in Zurich main station. The latter will serve as our test lab for developing the shopping experience of the future. Valora is also intensifying its focus on sustainability. The Board of Directors expects sustainability to become an integral part of Valora’s business activities. In doing so we focus on our role as employer, our impact on the planet and healthy and sustainable food products. Valora is not yet where it wants to be in every aspect, but we are constantly making progress. And we are doing everything in our power to meet our aspirations for ourselves. We owe this to our stakeholders and the environment. Valora has also taken important steps in 2018 to optimise its long-term financing structure. We took advantage of the attractive market conditions to place two Schuldschein issues and to redeem existing bonds. These measures will have a positive effect on the earnings per share in future. We are optimistic about the 2019 financial year and are well-positioned to achieve further growth with our clearly defined strategic focus on the convenience and food service segments. We are already the leading operator of kiosks and convenience stores in Switzerland, one of the biggest snack food providers in Germany, and a global leader in the production of pretzels. We will continue to develop our business on this basis. The around 15 000 employees in our network make a decisive contribution to Valora’s success and brighten up our customers’ journey every single day. We owe them a big thank you. We would also like to thank all our business partners and suppliers for the trust-based working relationship. You, our valued shareholders, also deserve great thanks for the trust you have placed in us, without which we cannot successfully implement Valora’s growth strategy. We are delighted to propose an unchanged dividend of CHF 12.50 at the upcoming General Meeting on 29 March 2019. The dividend will be distributed fully from capital reserves. 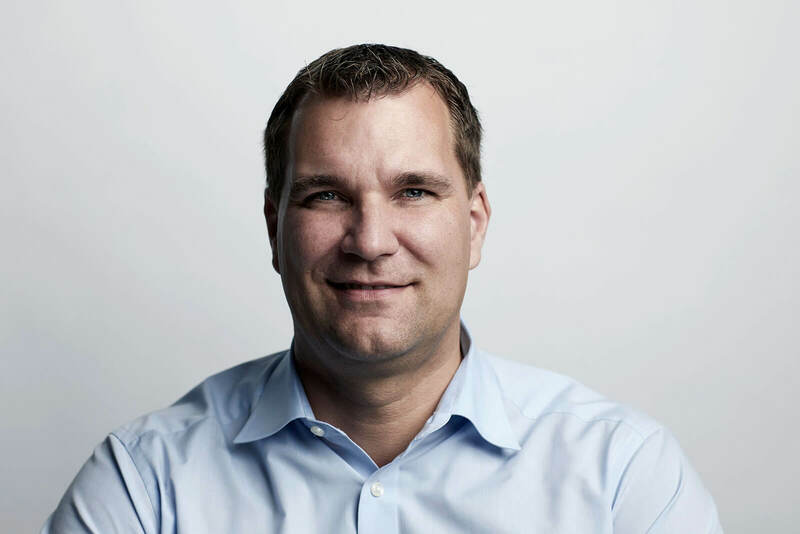 Michael Mueller, how did Valora develop in 2018? We have been pursuing our strategy consistently for years, and we made great progress once again last year. At the beginning of this strategy cycle, the aim was to focus on and consolidate our core business. Since 2015/2016, Valora has seen more growth initiatives, including acquisitions. Right now our focus is on renewing and further developing existing concepts: forward-looking, convenient and fresh. What specifically did you do last year? I am particularly proud of the complete revamp of our avec convenience format. The new management team in Switzerland managed to accomplish this in just five months, and we have already applied the new concept to nine sales outlets since July. The concept focuses strictly on the latest foodvenience and ultra-fresh products, which are clearly marked with the new label “Handmade with Love”. We now also carry a regional product line – a novelty in small-scale retailing in Switzerland. And k kiosk, Valora’s most well-known format, stayed the same? No. We also completely overhauled the k kiosk concept and will be opening the first new sales outlets in the spring of this year. We followed the same approach here as with avec: more food and more freshness. We have also updated the design, added more regional products, and simplified the sales processes. Plus the first Press & Books with a new, modern look has just recently been opened at the Zurich Airport. You made headlines at the end of 2018 by announcing the first cashier-free store in Switzerland. avec box is a unique concept that aims to make avec’s foodvenience and fresh product range available 24/7, a development made possible thanks to our efforts in the area of digitalisation. 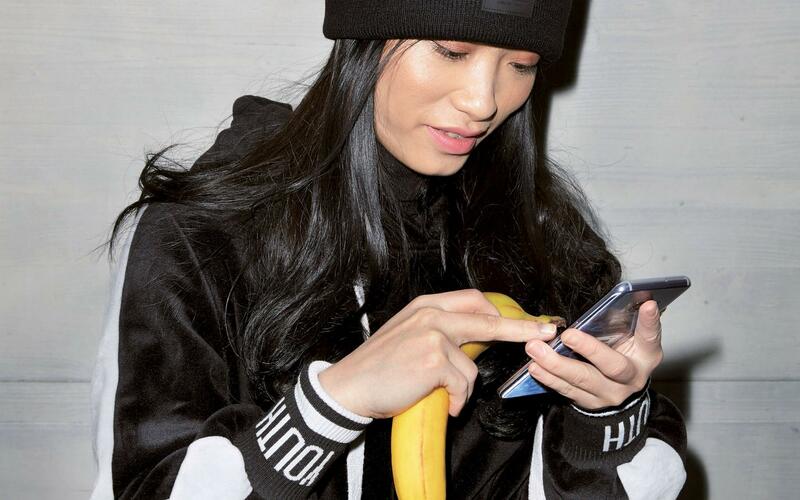 With this format, you access the store using an app, scan the products you want and pay for them directly. 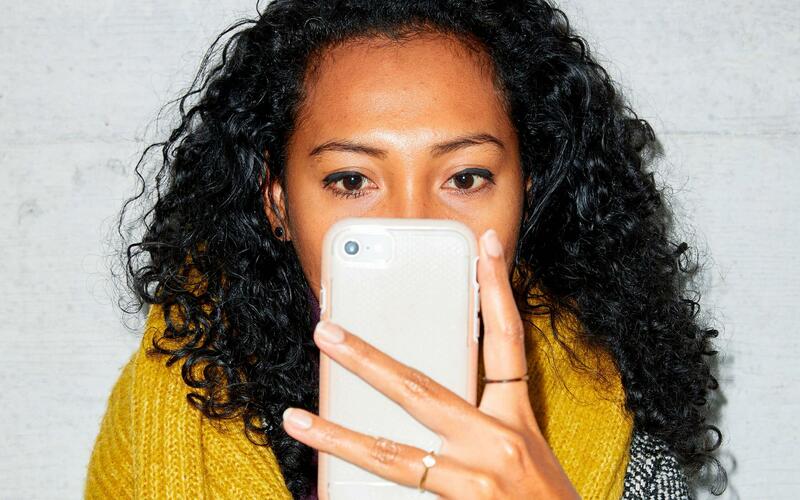 Customers can do their shopping any time, and at their own pace. This makes us a leader in innovation in Switzerland. We are developing a similar concept for k kiosk, but aim to take it a step further: thanks to our cooperation with the Silicon Valley start-up AiFi and its auto-checkout technology, the products do not even have to be scanned. Customers simply walk into the k kiosk box, take what they need and leave again. This has also earned some criticism. Yes, and we take that seriously. Among other things, we are being accused of cutting jobs and making working conditions worse for staff. We already have around 2 800 sales outlets in the European market and are pursuing a growth strategy. New technologies and concepts like the avec box are helping us to further expand the offering and provide even greater convenience – in the shopping experience too. We simply want to offer people more shopping options and better meet customers’ growing need for flexibility. At the same time, it allows us to access new sites with less footfall. Once we have opened the first avec box in spring 2019, we will have to gain some experience before we roll it out any further. There is a shift in the focus of staff activities in the avec box. When they’re on duty in the store they will no longer have to be at the checkout, but will have more time for the customers – helping out with the app, the purchasing process or the assortment, for example. At the same time, they take care of the shop. In 2017 you bought the German food service bakery BackWerk. How is that going? The acquisition of BackWerk made us one of the leading snack food providers in Germany. By now, BackWerk has become a permanent part of Valora. We are on track with the opening of new stores, while also eliminating the less lucrative locations from the network. In Frankfurt we opened the first BackWerk at an airport; the first BackWerk in Switzerland under the new concept opened in Winterthur; and we are now offering BackWerk products at ServiceStore DB. At the same time we are also selling our own pretzels and ok.– products through BackWerk. This is a great example of how we are capturing synergies and benefiting from our integrated value chain. You also mentioned your own pretzels. Today, we are one of the world’s leading pretzel producers and make about 650 million bakery products a year – for our own sales outlets and primarily for third-party customers (B2B). In 2018, the B2B business posted a strong growth of + 5.9 % in local currency and our production plants are running at full capacity. This backs up our decision to expand. We already doubled our production capacity at Ditsch USA in 2018. We are on track with building another production line in the US and two new additional lines in Germany and we will be able to start production in the fourth quarter of 2019. Are you equally satisfied with the B2C business in food service? Our same-store revenues were up at both Ditsch (+ 1.4 %) and Food Service Switzerland (+ 2.7 %). The latter was certainly helped by the revamp of the Brezelkönig concept in 2018 as well as the further development of our products. We also made considerable progress with the streamlining of the Ditsch store network. Food Service performed well overall, as you can see from the + 26.6 % rise in net revenues. This increase reflects both the consolidation of BackWerk for a full year and also organic same-store growth. These two effects drove EBIT by + 30.1 %. How did the operating business perform overall in 2018? In the past few years we have always announced ambitious and realistic goals and stuck to them. This is also true for 2018. EBIT rose by + 13.7 % to CHF 89.8 million. The EBIT margin was + 0.3 percentage points higher year-on-year at 4.2 %. The gross profit margin improved by +1.9 percentage points to 45.5 %. Net revenue increased by +6.0 %. Including the sales revenues of our franchise partners, external sales increased by +11.3 % to CHF 2 731 million. And in spite of substantial investments in our production sites, free cash flow per share is at the level of the amount of the attractive dividend. What specifically drove the sales growth? 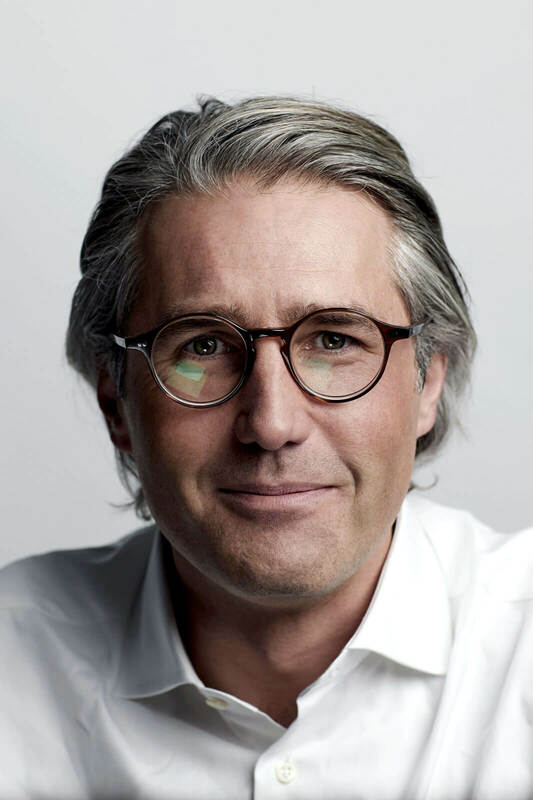 BackWerk, which was only consolidated for the last two months of 2017, made a major contribution to sales growth in 2018. In addition, there were positive currency effects and higher sales in the other Food Service areas. Retail DE / LU / AT also posted an increase in external sales of + 5.2 %, mainly due to currency effects. External sales at Retail CH were slightly down by – 0.3 % compared to the previous year. What I would like to highlight particularly is that Retail CH posted same-store growth of + 0.4 %. Also, the number of sales outlets was stable in the second half-year for the first time in quite a while. This is a clear affirmation that we are on the right track with the transformation of our kiosk business. What does the cost situation look like? Costs rose by + 10.4 % versus last year – partly due to the full-year consolidation of BackWerk and partly due to higher production volumes. EBIT at Group level improved thanks to BackWerk and the growth in Food Service as well as in Retail CH. This resulted in an increase in operating profitability – absolutely, and in terms of margin. Talking of profitability, is Retail CH still as profitable? We were able to keep profitability in this market segment at the high level seen the previous year. Do not forget that the 2017 figures included a book gain from the sale of the building in Geneva following the acquisition of Naville. Operating EBIT rose by + 4.6 %. The position does not seem as rosy in the German retail business. Retail DE / AT / LU had a challenging year: EBIT fell by – 25.1 %. However, we were able to more than make up for this thanks to Food Service and Retail CH. So was the print media business in Germany still under heavy pressure in the second half of 2018? Yes, Retail Germany is experiencing an intensified, market-driven decline in high-margin print media with a certain delay to Switzerland. We are taking measures to counteract this, cutting costs and driving the expansion of e-smoke, for example. It will take some time for the measures to have their full effect. In the second half of the year, we were already able to mostly soften the print media effect. Tobacco, food, non-food and services did well, and same-store sales of Retail DE / AT / LU were down by only – 0.2 %. Alternative nicotine products seem to be experiencing a boom. They are fashionable and we are one of the first providers with nation- wide coverage. In Germany we are more advanced with e-smoke than in Switzerland. Even though these are still niche products, demand for e-cigarettes and for “heat not burn” alternatives is steadily rising. Protecting young people is very important for us. That is why Valora applies a minimum age of 18 in Switzerland too for all e-smoke and tobacco products, even though the law does not yet require this everywhere. What happened in 2018 with the various services mentioned before? Services are becoming increasingly important and are helping us to compensate the decline in print media. This is made possible by innovative digital solutions with third-party companies and our dense network of sales outlets. Our network is highly attractive, especially for new payment or pick-up / drop-off options. 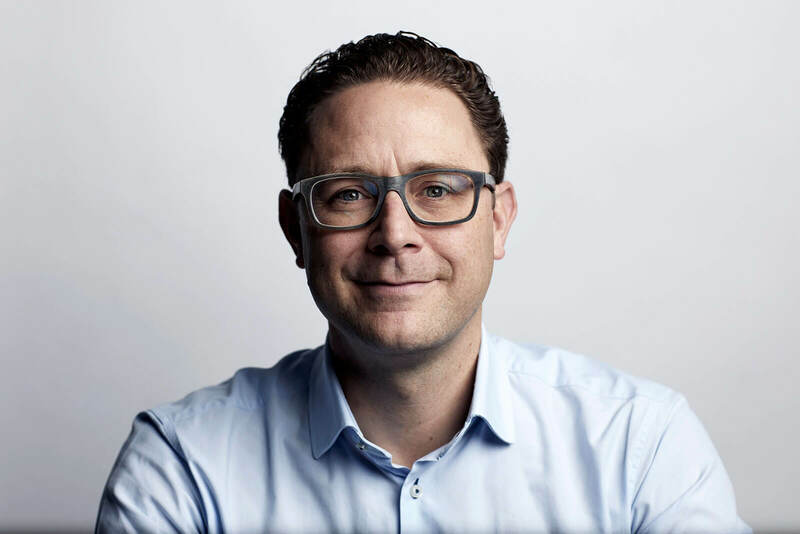 We were able to expand the Swisscom easy point offering launched at the start of 2018 over the course of the year. We now also have the Sonect app, which allows customers to withdraw cash in Swiss kiosks. In Germany we offer the new “amazon top up in store”. These are just some of the examples that show how the shopping of tomorrow is bringing the online world and physical sales outlets together again. bob Finance is mainly involved in online business. How are you getting on? bob Finance had a profitable second half-year and we now wish to invest more in this business. In 2018, the offering was expanded with new digital payment and financing products for the B2B2C area. Partners benefit from rising sales, while customers enjoy more convenience. Consequently, the products meet with high interest from online as well as stationary retailers. The first partnerships were launched successfully. The Future Store is also meant to be something new. What can we expect there? 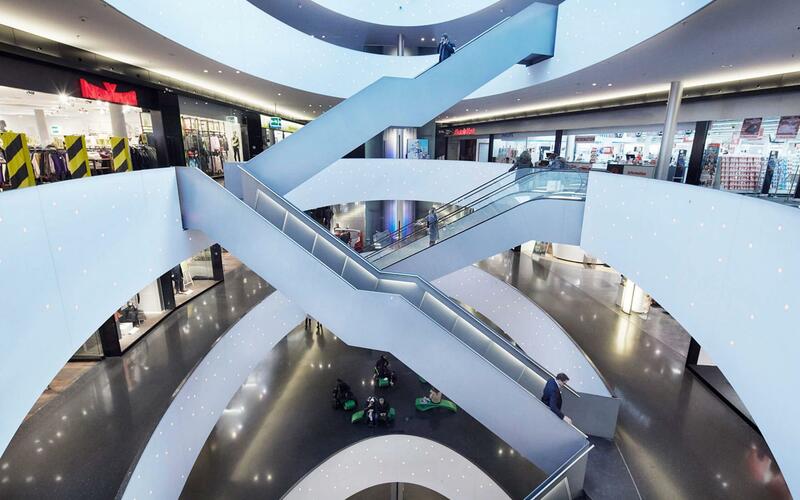 The Future Store in Zurich main station is scheduled to open in April 2019. It will be called avec X and will mainly be a test lab for Valora to try out newly developed digital aspects of the shopping experience like checkout processes and personalised shopping, along with other forward-looking themes in the convenience segment. And what is the long-term destination for Valora itself? Valora offers the best food and convenience concepts. That is our vision. To achieve this, we strive for operational excellence, ongoing innovation and agility, and optimum value creation. This is based on the underlying premise of a comprehensive understanding of the customers and formats. What strategic levers do you have available to help you achieve this vision? We have further sharpened our corporate strategy. We want to extend the foodvenience locations in transport hubs and inner cities. We will do this together with our agency and franchise partners. We also want to further promote our internal product competence through our own production and own brands such as ok.–. At the same time we are continuing to develop the international B2B distribution and production business for our pretzel products. All this will be done using simplified processes and the latest technology for a delightful customer experience. We also attach more importance to sustainability. Has sustainability not been an issue for Valora before? Of course it has. But to date sustainability has not been embedded in our strategy systematically enough. We are changing this now. Our stakeholders rightly expect Valora, as a responsible company, to make its contribution to sustainable development for people and the environment. Valora has reorganised itself in response to the strategy. Why was that necessary? We want to be closer to the customers, integrate new businesses more easily, exploit synergies and profit more from the wealth of know-how available in the company. So we have grouped together the things that belong together and made the structure consistent. There are now two divisions with a market and customer focus, Retail and Food Service, and Group-wide Shared Services. 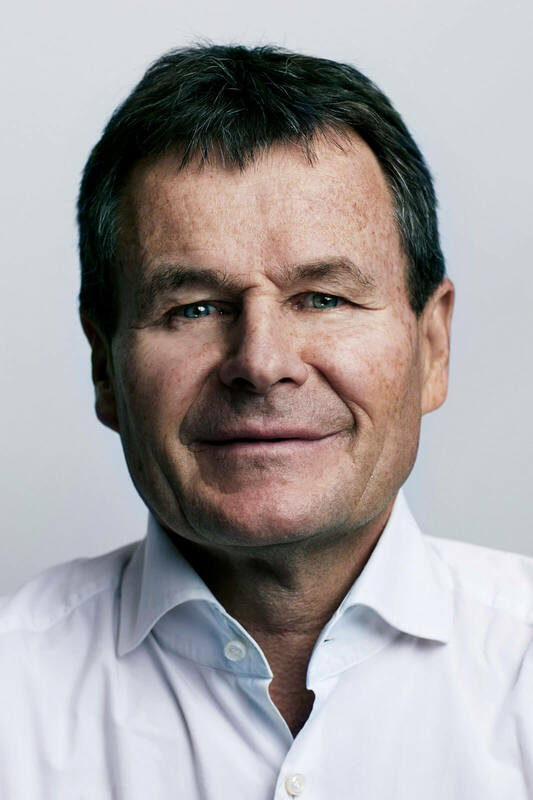 Among others, we have combined the B2C formats BackWerk and Ditsch in Germany and placed Digital Innovation directly under the CEO. The new structure will make us stronger. How do you drive the growth going forward? We specifically align our formats to the latest customer needs and have strong brands that still have great growth potential. With the renewed formats Valora is ideally positioned to profit from the global growth trends in convenience and on-the-go consumption. We will in future also offer more unique snacking experiences at an attractive price and expand our range of services for people on the move. Our investments in the production facilities will also pay off from 2020 onwards. We see further opportunities for growth with BackWerk in the Netherlands and Austria, and using international franchise partners for Brezelkönig. Finally, our capital base allows us to make acquisitions that add to our formats and/or expertise – we look at opportunities on a regular basis. How do you see your capital strength and long-term financing? Our reliability and credibility have allowed us to further optimise our capital structure in the past year. We placed a Schuldschein issue of EUR 170 million at the beginning of the year. 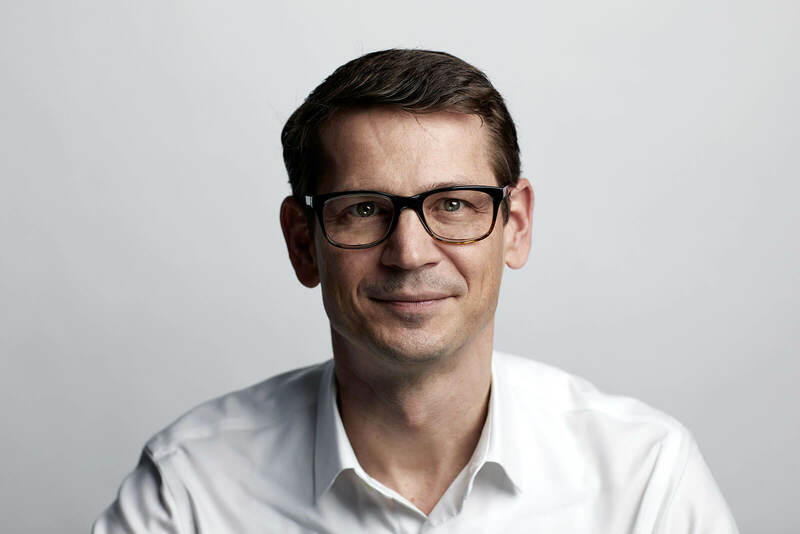 This was followed by a Schuldschein issue for another EUR 100 million and CHF 63 million in December 2018, which was used to refinance an expiring EUR Schuldschein issue and part of a CHF hybrid bond. The Swiss franc tranche was an innovation in the market. Demand was strong, well above our expectations. This allowed us to benefit from the attractive market conditions and further cut our financing costs. Might the possible loss of rental space as a result of the current SBB tender be a stumbling block? We have made an excellent submission and are convinced that our new and refreshed formats meet the needs of train travellers precisely. We are therefore optimistic that we will be able to successfully continue the strong and long-standing partnership with the SBB. Our unique expertise in small-scale retailing at heavily frequented sites and the strong offering of unique products and innovative services will be powerful arguments for awarding the sites to Valora again. So you are optimistic for 2019? Yes. 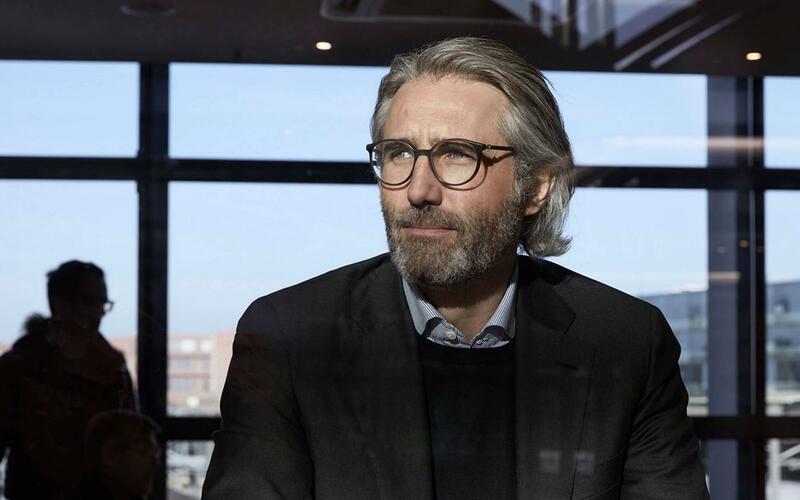 We will benefit from the advantages of the new organisational structure, and also the additional synergy effects between the formats and markets. Many of the measures taken in 2018 will have a greater impact in the new year. These include not least the continued rollout of the new avec concept and the launch of the revised k kiosk concept. The higher food share will help us in terms of both customer frequency and margins. In recent years we have demonstrated that our business model is very resilient and that we are able to deliver on our promises. 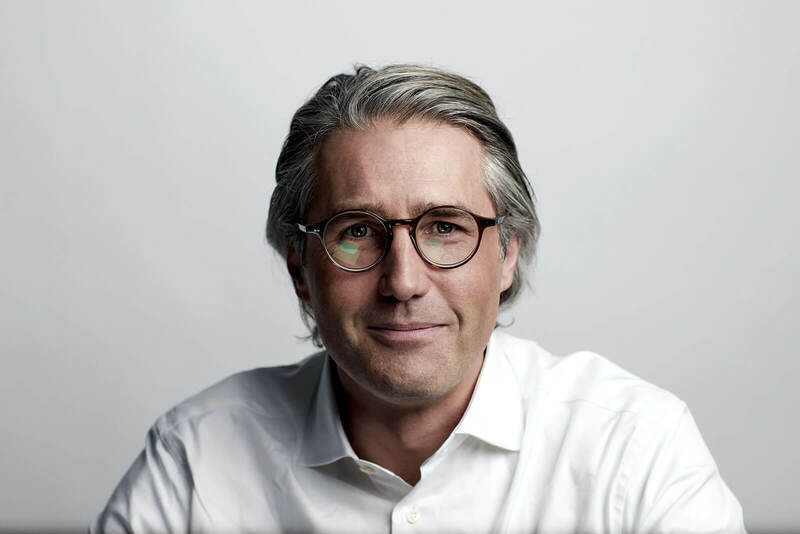 With an EBIT of CHF 89.8 million, 2018 was a strong financial year for Valora once again confirming the communicated expectations. The convenience and food service provider’s EBIT increased by + 13.7 % year-on-year and the EBIT margin improved by + 0.3 percentage points to 4.2 %. 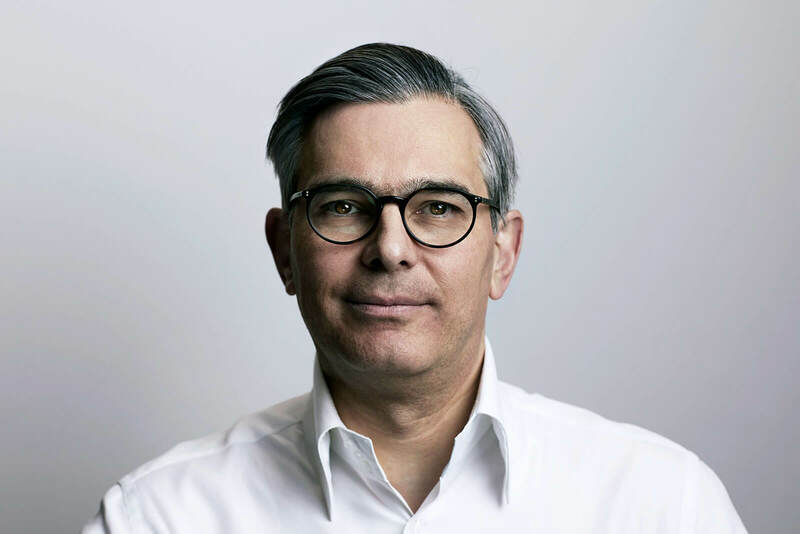 Owing to the profit contribution by the franchise company BackWerk acquired in autumn 2017, organic growth and positive currency effects, EBITDA improved by + 16.7 % or CHF + 22.3 million to CHF 156.0 million. External sales increased by + 11.3 % to CHF 2,731.0 million and net revenues grew by + 6.0 % to CHF 2,122.1 million, which corresponds to growth in local currency of + 9.4 % and + 4.6 % respectively. Net profit from continuing operations increased by + 12.2 % to CHF 64.1 million and Group net profit grew by + 3.2 % to CHF 59.0 million. At CHF 49.0 million, the Group’s free cash flow was down on the previous year, mainly due to increased investment activity and the one-off proceeds posted in 2017 on the sale of the property in Geneva that was taken over as part of the Naville acquisition. The Group’s return on capital employed (ROCE) improved by + 0.5 percentage points on the first half of 2018 to 8.2 %, which is slightly below the previous year (8.6 %) because of the acquisition-related increase in capital employed. Retail CH maintained profitability at the previous year’s high level, with operational improvements making up for the book gain posted in 2017 from the sale of the Naville property. The market unit developed innovative concepts in 2018 and refined all sales formats – avec, k kiosk and Press & Books. These updated formats were also included in the offer submitted to the SBB for the tender of rental spaces. Retail CH also expanded its product range in 2018 with forward-looking ultra-fresh food offers, regional products, alternative nicotine products and services. Retail DE/LU/AT had a challenging financial year with the expected ongoing market-driven decline in high-margin print media. Cost initiatives and projects, such as the further promotion of alternative nicotine products (e.g. 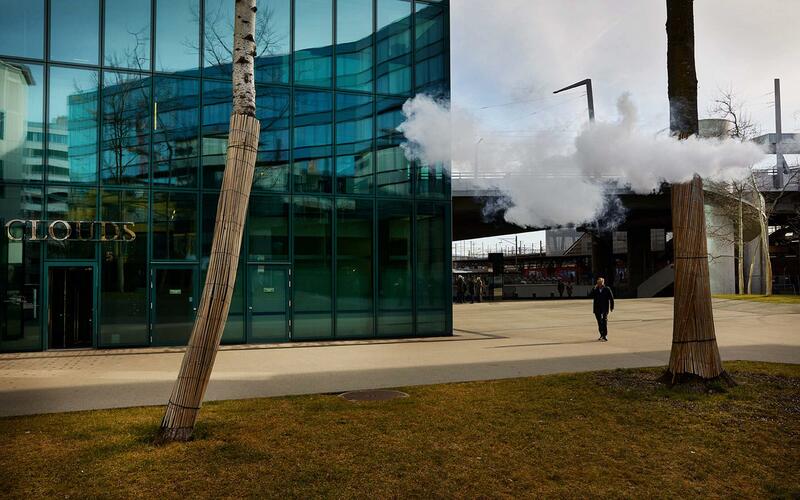 e-smoke) were pursued with increased focus and already helped to improve the EBIT margin compared to the one posted for the first half-year, even though these initiatives are still in the start-up phase. In the Food Service division, the gross expansion of BackWerk is progressing as planned. The BackWerk network was streamlined by closing down less lucrative locations and franchisee efficiency was enhanced further. Focusing on sustainability and profitability, Ditsch made considerable progress in optimising its network. 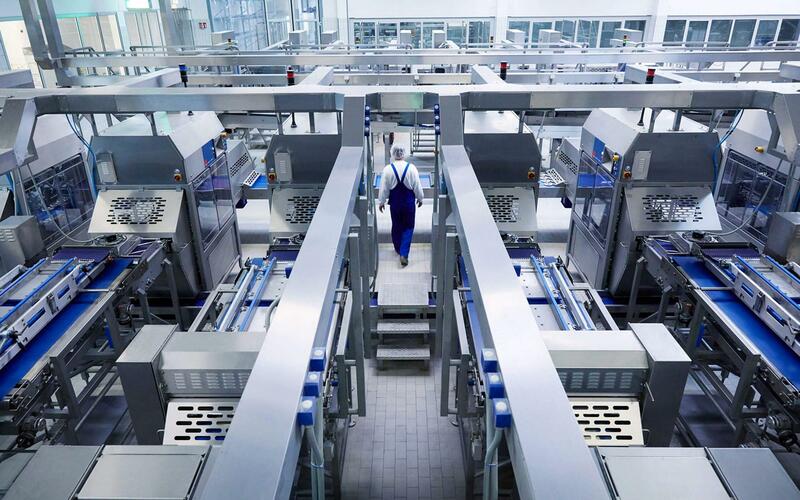 The expansion of capacity for pretzel production for the B2B business and own formats is also progressing well: after doubling the capacity of the current line at Ditsch USA in 2018, projects to expand production capacity in the US by another line and to add two more production lines in a new, separate building at Ditsch Germany in Oranienbaum are planned for 2019. Valora has also taken important steps to optimise its long-term financing structure. It took advantage of the attractive market conditions to place two Schuldschein issues in 2018, whereby the second transaction was closed on 11 January 2019. In October 2018, the hybrid bond was redeemed and partly refinanced with the second Schuldschein issue. The latter for the first time contained a CHF tranche – a novelty on the market. With the new organisational structure which entered into force in January 2019, Valora is even better prepared for the future. The organisation is structured into the two market- and customer-focused Retail and Food Service divisions comprising the decentralised sales formats and Group-wide Shared Services, which allows better transfer of cross-divisional and Group-wide know-how and a joint sourcing strategy. The new structure also supports the exploitation of anticipated synergies from the BackWerk acquisition. 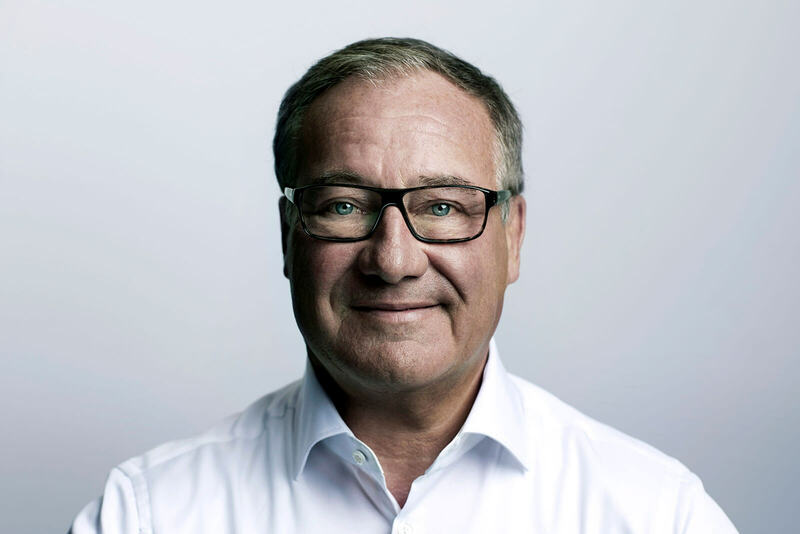 The Board of Directors and Group Executive Management are convinced that they have positioned Valora Group perfectly for success and further growth in 2019 with this new organisational structure and the initiatives launched in 2018. The world around us is changing at an ever faster pace, the environmental challenges are becoming ever bigger, and Valora’s customers are growing increasingly aware of the working conditions underlying the products. Valora is facing these challenges head-on. Its stakeholders rightly expect Valora to contribute to sustainable development as a responsible company. The growing world population, an ever bigger global middle class, urbanisation, climate change and the multiplier effect of digitalisation – these megatrends not only affect Valora directly, but also have an impact on its customers, employees and value chain. They harbour opportunities as well as challenges and increase the urgency for Valora to intensify its own sustainability agenda. The statutory provisions serve as the minimum standard for Valora. A responsible company looks after its employees, protects the environment, manufactures excellent products that outstrip the expectations of its customers, and in the process generates a return for its shareholders. “Sustainability is a permanent and important component of Valora’s strategy. The company is not yet where it wants to be in every aspect, but we are constantly making progress. And we are doing everything in our power to meet our aspirations for ourselves. 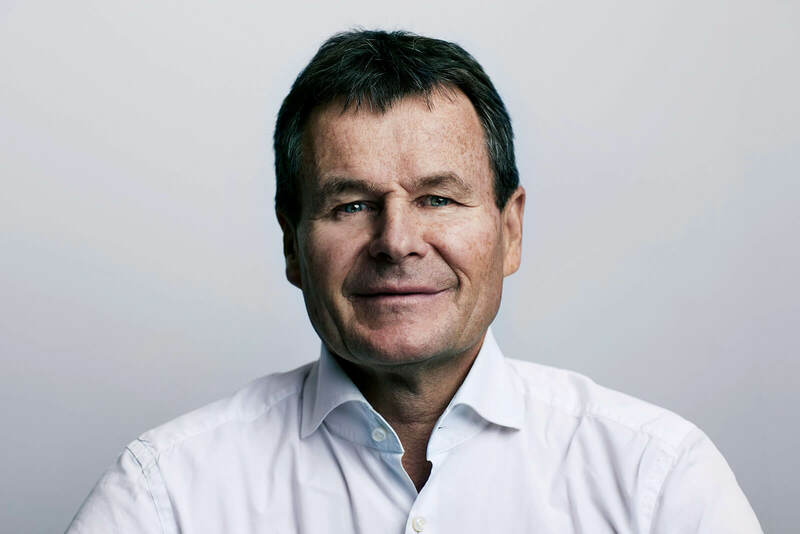 We owe this to our stakeholders and the environment,” says Franz Julen, Chairman of the Board of Directors. Valora wants to assume this responsibility and live up to the challenges. A working group was set up in 2018 to develop a systematic strategy based on as well as extending beyond the existing sustainability measures. The working group consists of members of the Board of Directors, the CEO and management. They identified the connections between the aforementioned megatrends, the company’s own business activities and the trends affecting the business sector. The 17 Sustainable Development Goals (SDGs) of the United Nations were also consulted in order to identify additional areas where Valora can potentially make a contribution to sustainable development. Last year, the corporate strategy was already streamlined to meet Valora’s vision of offering the best food and convenience concepts. In addition to growth, efficiency, a performance-oriented culture and innovation, the strengthening of the sustainability commitment as a responsible contribution to humanity and the environment is one of our five material strategic ambitions. The further development of the sustainability strategy will be aligned to the expectations of Valora’s stakeholders. The following graph identifies the most important stakeholders and their expectations. Stakeholder expectations show: Valora’s commitment to sustainability is not only good for humanity and the planet, it is also a strategic requirement. Business success will be even more dependent on social and environmental sustainability in the future. Valora’s customers increasingly want to know where the products are coming from. Who made them, were human rights respected and was the impact on the environment minimised? Valora wishes to honour these requirements and to offer sustainable products in line with its maxim “We brighten up our customers' day. Wherever people are on the move.” The Board of Directors expects sustainability to become an integral part of Valora’s business activities and a strategic management pillar. Valora squares profitable growth with sustainable growth by adjusting its operational processes, procedures and products while always keeping an eye on the people. This gives rise to the three pillars People – Planet – Products, which will in future provide the structure for Valora’s sustainability management process. A dedicated claim explains the aspiration asserted by each of these pillars. These three pillars will not only be used for the further development of the strategy, but also provide the structure for the following pages. This year the focus falls on the People pillar. Our reporting will be expanded further in the coming years, in particular with regard to the Planet and Products pillars. Valora is not only measured by its business performance, but increasingly also by the way and principles by which it generates its profits. Business success and ethical conduct are not contradictory principles. Rather, they are essential conditions for Valora’s sustainable corporate development. The key figures and expectations in this regard are set out in Valora’s Code of Conduct, the updated version of which entered into force on 1 January 2019. New sections were added on the protection of property, mutual respect and data privacy. Another new section introduces Valora’s values: “open”, “trustworthy”, “passionate” and “for and with one another”. The organisation will implement the new Code of Conduct with an e-learning module in 2019. In addition, a revised Code of Conduct for Business Partners will replace the current Supplier Code in 2019. This will expand the scope of application from suppliers to all business partners. The new Code also includes sections on data privacy, free competition, conflicts of interest, protection of business secrets and compliance with anti-money laundering legislation. Since 1 January 2019, Valora’s employees and business partners can contact the Valora Integrity Line to report violations or suspected violations. This platform provides all Valora employees with a simpler and more user-friendly option for reporting irregularities in the company, such as theft, infringements of labour law or other suspicions easily, anonymously and online. The platform can be accessed around the clock via smartphone, tablet and PC. The Integrity Line replaces the Ethics Hotline, which has been in operation since 2011. With the updated Code of Conduct, the Code of Conduct for Business Partners and the Integrity Line, Valora has laid the foundation for all other sustainability measures. Valora's Code of Conduct and Integrity Line can be accessed by the public on the website. Sustainability is not only good for people and the planet. Valora benefits with regard to its employees, competition and investors. Valora also reduces its costs and risks through sustainable business practices. This means that Valora’s commitment to sustainability is a strategic requirement. 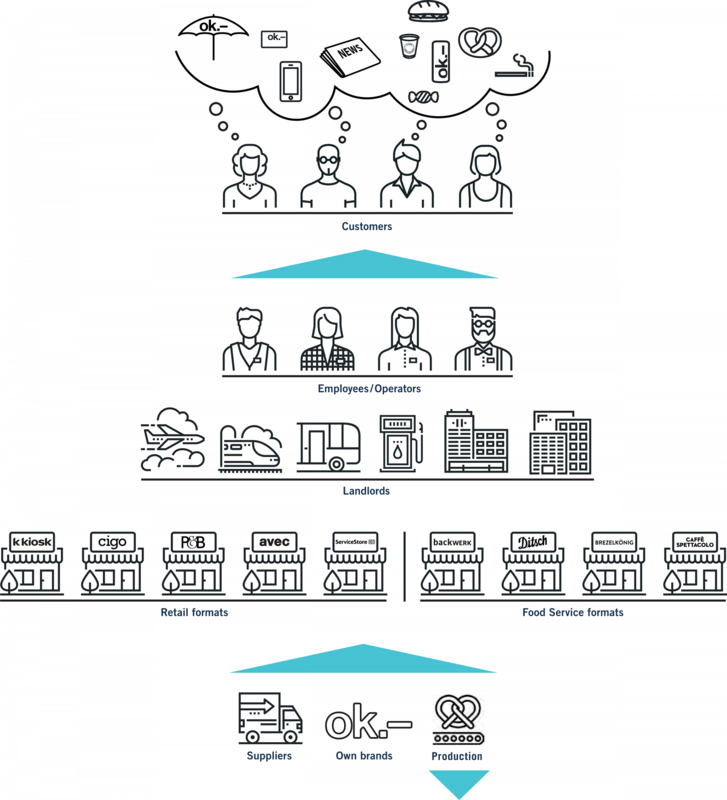 Valora’s evolution into a focused retailer has simplified its value chain. Supplier products, our own brands and our own production output are sold to other companies (B2B) as well as to consumers (B2C). Customer sales are channelled through different formats, whereby the sales outlets are operated by Valora employees as well as franchise and agency partners. They brighten up their customers’ day, at airports, railway stations and central urban locations. Valora and its employees benefit equally from fair treatment and equal opportunities. Diversity is helpful at all levels. It promotes performance and innovation capacity and contributes to the successful introduction of new formats and products. This is why Valora supports an inclusive culture where each and everyone is recognised for their unique contribution and is allowed to realise their own ideas. Valora does not tolerate any discrimination based on personal background. Women account for 70 % of Valora’s workforce. Two-thirds of them work part-time, while around one-third of the men work part-time. 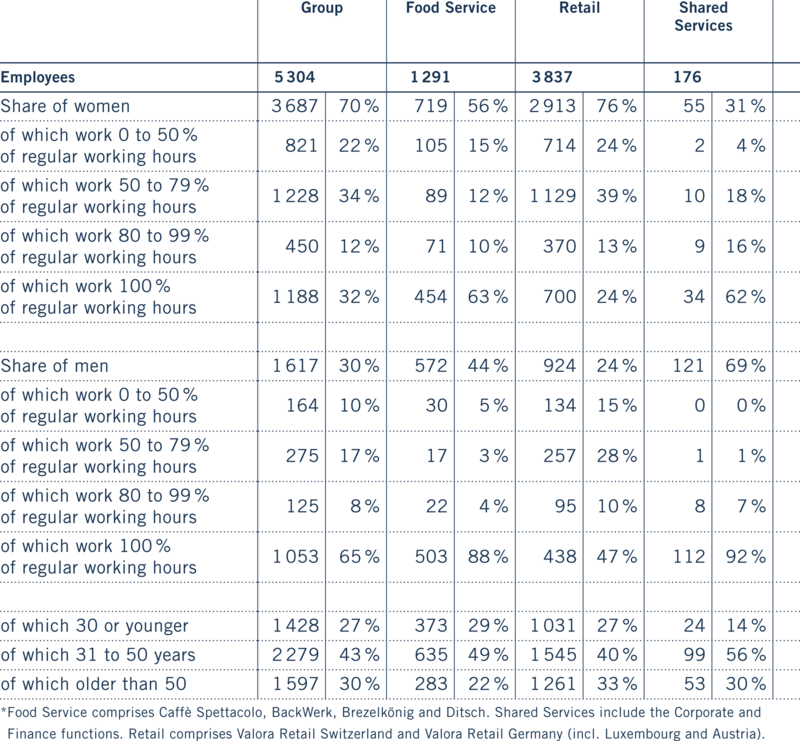 The age distribution is very balanced, whereby the Food Service employees are younger than the Retail employees. Valora plans to survey and analyse additional diversity criteria across the different hierarchical levels in the future. On this basis, Valora will in future approach the topics of inclusion and equal opportunities more systematically. In order to meet their and their family’s basic daily needs, employees should earn salaries that are customary to or in line with the market and benefit from modern and socially responsible working conditions. Because only satisfied employees are motivated to put Valora’s maxim “We brighten up our customers’ day. Wherever people are on the move.” into practice. The social partnership with the Swiss Association of Commercial Employees (kfmv) and the adopted Collective Labour Agreement (CLA) make an important contribution in this regard. The new Valora CLA for Switzerland entered into force on 1 January 2018. 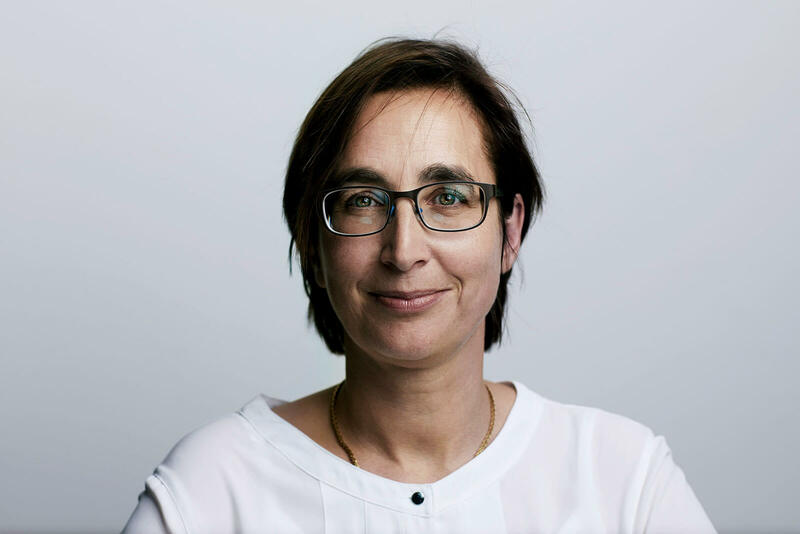 This implemented a salary increase for Valora employees in Switzerland of 1.8 % on average. The k kiosk and Press & Books agency partners undertake to pay their employees the CLA minimum salary. There is no collective labour agreement in Germany. Here, Valora bases its principles on the framework conditions of the applicable wage agreements. Valora carries out regular employee surveys to identify employees’ expectations and to formulate measures for improvement. Following unit-specific surveys in the previous years, Valora for the first time carried out a Group-wide employee survey in 2018. Around 2 800 employees (52 %) participated in the survey. The survey identified employees’ expectations with regard to key improvements. In future, Valora wishes to improve employee commitment and satisfaction with additional measures. Employees expect more transparency and information from management in these times of digital change. As there is also a need to optimise some aspects of personnel development, a number of tools such as the recruitment process and the onboarding programme are in revision and an individual, job-focused induction programme is under development. The measures that are being implemented should have a positive effect and help to reduce the turnover rate (44 %). According to the employee survey, other expectations differ greatly by unit and region. Valora has already implemented measures to increase the rate of participation in future surveys. The survey process has been revised and employees at the sales outlets will in future be able to participate electronically in the survey. Valora does everything in its power to ensure that its employees can work in a safe and healthy environment where they can inspire their customers. It is not only a corporate obligation to ensure health, safety and wellbeing at the workplace, it also leads to lower injury and absence rates. Valora therefore provides a safe, ergonomic and healthy work environment with attractive and modern workstations where employees remain physically and emotionally healthy, are satisfied with their work and have the energy to inspire their customers. To promote health and wellbeing, the business areas identify the risks relevant to health that need to be addressed and instigate the required measures. In spite of all efforts, occupational accidents increased from 127 to 158 in the reporting year. Most accidents occurred at Valora's own sales outlets and its production facilities. To counter this trend, Valora will deploy more occupational health and safety inspectors and carry out regular inspections of all areas. For its 135 employees, BackWerk has its own company doctor who visits the sites at regular intervals and offers employees personal consultations and free preventive examinations. Regular visits to all sites by an occupational safety specialist also makes it possible to identify risks and implement the required measures. To promote the wellbeing of its employees, BackWerk offers courses such as fascia training, yoga and back therapy training and supplies them with adjustable height and ergonomic desks. Not only the retail business but also society as a whole is in the grip of a rapid process of transformation. Digitalisation makes many things possible, but also gives rise to totally new needs and expectations among customers and employees. The present day has become much faster-paced and more complex. To enable employees to cope with these challenges, Valora supports their personal and skills development. They should have opportunities for advancement and the chance to fully exploit their potential at a workplace defined by commitment and cooperation. Valora therefore maintains a comprehensive programme of further education measures for its own employees as well as those of its franchise and agency partners. For its own employees, for example, Valora offers a comprehensive programme including coaching, internal and paid external courses as well as the Valora Campus. Some 1 500 employees made use of these offers in 2018. As Valora aims to develop the next generation of employees internally, it is training 74 apprentices, three more than in the previous year. Most of them work in administration or production, but the sales teams are also training 18 apprentices. As part of its partnership programme, Valora offers its franchise and agency partners coaching sessions and seminars, which were attended by around 1 600 partners in 2018. E-learning programmes ensure an even wider reach. These focus on topics such as occupational safety, hygiene, money laundering and youth protection. More than 12 107 modules were completed in 2018. Valora also for the first time offered a Group-wide training course on information security in 2018, which was taken 4 785 times. In order to remain aware of the needs of its customers as well as its franchise and agency partners, Valora maintains a culture of open communication and collaborative partnership with the latter. At the same time Valora allows them room for entrepreneurial initiative. Because those who can act independently are committed, motivated and develop their own ideas. The independent entrepreneurs can also rely on Valora as a partner who offers them top locations and supports them with training, know-how and operational advice. By now, around 80 % of sales outlets are operated by franchisees and agency partners. 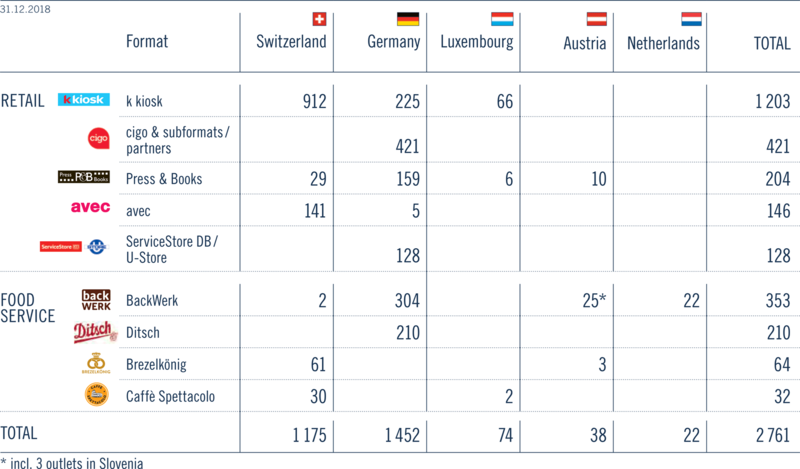 The agency partner model is more common in Switzerland, while the franchise model is preferred in Germany. Valora’s agency model in particular offers its partners entrepreneurial freedom at a containable risk. 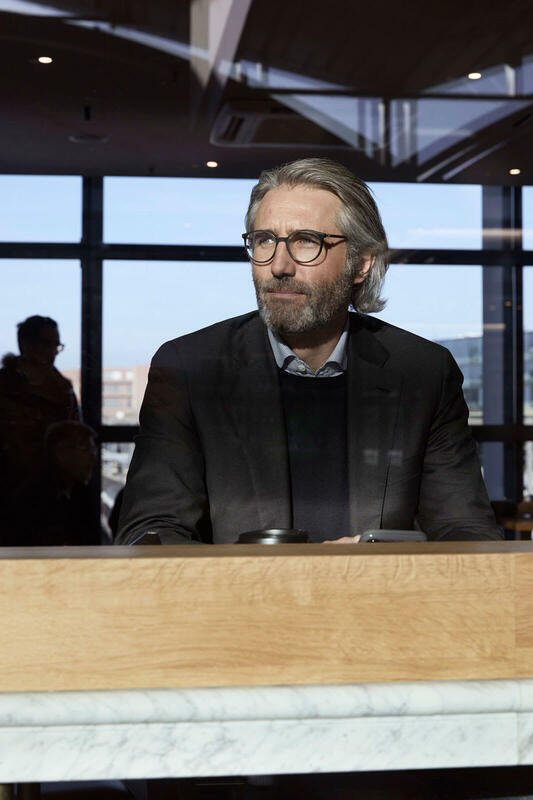 For example, k kiosk agency partners in Switzerland are trained for three months as employees of Valora, after which they become independent and receive commission on their sales. Valora is responsible for the rent, goods and equipment. A partnership can only be successful in the long term if Valora and the partner benefit equally from the arrangement. Valora Retail Switzerland, Brezelkönig, Ditsch and BackWerk therefore regularly carry out satisfaction surveys among their partners. At the end of 2017, the Swiss partners particularly commended Valora’s friendliness, but identified room for improvement as regards information policy and availability. Both franchisees and agency partners are independent entrepreneurs who participate in the success of their business. The biggest difference between the two concepts lies in the fact that franchisees sell the goods in their own name and for their own account and pay a franchise licence fee to Valora. Agency partners on the other hand sell the goods in the name and for the account of Valora and receive an agency commission on their turn-over, which they use to pay their staff, among other things. Individually packaged products, own production output and fresh products cause general and food waste. Both cost resources, energy and money. Valora’s aim is therefore to substantially reduce its waste and to implement a closed-loop system promoting the reduction, reuse and recycling of raw materials. In the long term, Valora endeavours to use its waste to develop reverse material flows. To reduce waste, Valora has been charging between 5 and 30 cents for plastic and paper bags at all its Swiss outlets since 1 November 2018. Valora will donate the proceeds to a good cause once a year. Based on the earnings since 1 November 2018, Valora expects these proceeds to be in the high five-digit range. The retail sales outlets in Germany and Austria also charge 20 to 25 cents per plastic bag. To reduce food waste, Caffè Spettacolo has been working with Too Good To Go since November 2018, with four outlets offering meals shortly before closing time at lower prices via the Too Good To Go app. This programme was rolled out to all Caffè Spettacolo locations at the beginning of 2019. Brezelkönig and avec will launch their own additional pilot projects. Convenience products require elaborate packaging: from wrapped sandwiches to coffee sold in cups and bottles for beverages. Packaging is also used for the own production output, albeit to a lesser extent than in the sales segments. With sustainable packaging, Valora and its suppliers can protect the environment, reduce the costs of waste disposal and improve the customer experience. Valora can exert considerable influence on the packaging used for its own brands. In 2018, for example, Valora introduced a deposit system for the ok.– energy drink range in Germany. The cans are now part of a recycling system and are reused. In general, Valora aims to use as little plastic and other non-degradable materials as possible in its production processes. It tries to manufacture its products in the most environmentally benign way possible. Naturally, the packaging still has to protect the product as required. For fresh products, such as coffee or pizzas, Valora exerts its influence on the local packaging. Valora promotes reusable solutions, certified materials and organic materials in order to reduce plastic waste. Several Valora units promote the use of reusable cups (as opposed to disposable cups). There are also more environmentally-friendly alternatives to disposable cups. In 2018, Ditsch switched from double-walled to single-walled coffee cups, thereby reducing its material consumption by 40 %. A PEFC label also guarantees that the material was obtained from sustainable forestry exploitation. Brezelkönig changed to sustainable material for its drink stirrers (bamboo) and completely eliminated the use of straws. Caffè Spettacolo is planning to find a future replacement for plastic lids. This year, Ditsch will investigate how to further improve the bags used for baked goods. Ditsch’s production team is also optimising its use of paper and its share of recycling. ServiceStore DB is expanding the concept of reusable cups to reusable bread boxes. Progressive data capture will make it possible in future to measure the overall effect of all these measures. Disposable cups represent enormous resource consumption. All Valora formats therefore also fill up reusable cups. 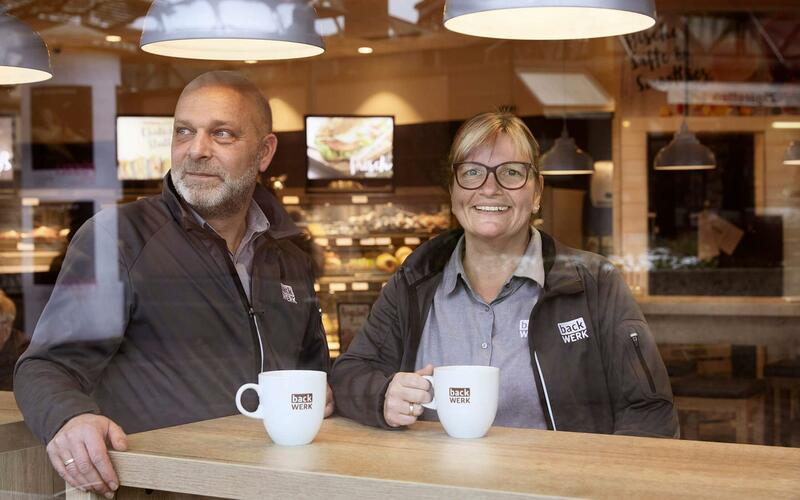 At Brezelkönig, Ditsch, ServiceStore DB, Caffè Spettacolo and the participating franchise partners of BackWerk guests who bring their own reusable cup either receive a free upgrade to a “grande” coffee or a discount. Various Valora formats sell reusable cups. The around 150 cigo, k kiosk and Press & Books branches in Germany offer a particularly eco-friendly cup made from sustainable bamboo fibre, corn kernel powder and melamine resin. Valora is planning to expand sales of its own reusable cups in 2019. The use of fossil fuels is the main cause of climate change. Energy consumption is therefore a relevant cost factor, in particular at our production locations. Valora is working on improving its energy efficiency in production as well as at its sales outlets and administration. Valora is also making increasing use of renewable energies. During renovations done in Switzerland, conventional lights are replaced by LED lights whenever possible, time switch clocks are installed where it makes sense to do so, and air conditioners using old-fashioned coolants are replaced. In 2018, energy consumption at the production plants rose by 2.8 % compared to 2017, which reflects the increase in production volume. Total energy consumption was 38,609 MWh. Of this, 76 % was electricity and 24 % gas. Local products reduce transports costs and thus emissions. Shorter routes save time and keep the products really fresh. According to a study carried out by the University of St. Gallen, customers have also noticed this and 80 % of them react positively to regional products. Valora is therefore expanding its range of local products, taking care to offer authentic products of high quality. 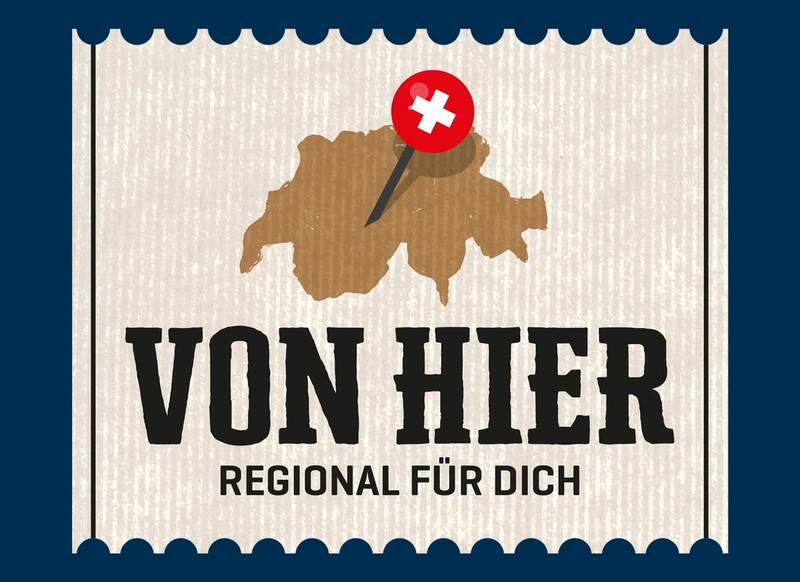 Since 2018, Valora has used the “Von hier. Regional für dich.” (From here. Regional for you.) label to identify products obtained from selected regional suppliers. With this initiative, Valora launched the first convenience label for regional products in Switzerland. It supports smaller businesses and reduces the environmental impact with shorter transport routes. 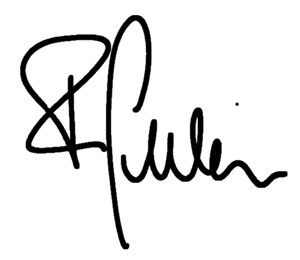 Compliance with these requirements is checked by the independent certification company ProCert. The criteria include, for example, that at least 80 % of the ingredients and 66 % of the value added for composite products have to be regional. From its introduction until the end of the year, a total of 127 regional products were included in the product catalogue in cooperation with 19 regional suppliers. The regional products will be rolled out further in 2019 so that almost all avec sales outlets will offer regional products under the new label by the end of 2019. During this roll-out phase, regional products should reach a share of 1 % of sales of “fresh” products. An example of a regional product carrying Valora’s “From here. Regional for you” convenience label is “Echti Churer Milch” from Plankis. The Plankis Foundation founded in 1845 with a legacy from Johann Peter Hosang provides assisted living facilities and protected jobs and study places to people with disabilities. On the farm estate, 20 people have a secure job in agriculture and the farm’s own Alpine dairy, which processes the milk produced by 60 cows and 100 dairy goats. The production chain for the products offered by Valora has a particularly strong impact on sustainability: from the production of raw materials to processing, the environmental impact and affected jobs are spread over many upstream levels of the value chain. Valora’s Code of Conduct for Business Partners sets out social and environmental standards for its suppliers. Valora ensures compliance with other sustainability aspects by using fair trade and eco labels. The Caffè Spettacolo coffee beans, which are also sold by ServiceStore DB, U-Store, k kiosk, avec and Press & Books, are certified to be fair trade. Ditsch will switch to this coffee in spring 2019. BackWerk serves organically certified ice tea. When choosing the products to be offered for sale, Valora increasingly pays attention to the sustainability of the ingredients and prefers to use suppliers who meet high environmental standards. Palm oil, for example, is an ingredient with a massive environmental footprint. Brezelkönig and BackWerk therefore do not use any palm oil at all in their products, while Caffè Spettacolo only uses it in vegan products. Ditsch has been a member of the Roundtable on Sustainable PaIm Oil (RSPO) since 2015 and only procures palm oil under the “segregated” model. This means that certified palm oil is never mixed with conventional palm oil. Valora is planning to continuously increase the share of products certified to be sustainable in its range. Valora’s customers attach great importance to animal welfare. Livestock farming, transport and slaughter are only a few aspects that play a role here. Pretzels, one of Valora’s main products, do not contain any animal-derived ingredients. 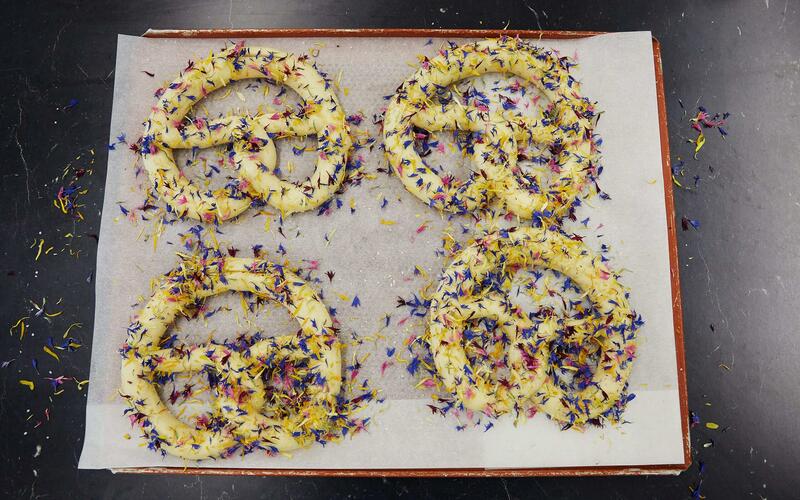 Lye pretzels are vegan by nature. The Valora Group has decided to offer products exclusively with barnlaid or free-range eggs in the future. This applies to the sale of eggs themselves as well as to products containing eggs. All products should meet this standard by 2020 at the latest. Valora has entered into an agreement to this effect with the animal rights organisation The Humane League, which applies to all Valora’s business units and for all countries in which Valora operates. Valora is planning to pay even more attention to animal welfare for products containing animal-derived ingredients. Among others, Valora intends to offer alternatives to products containing animal protein in the future. The greatest happiness is fleeting if it harms your health. Valora’s customers are increasingly paying attention to their health. Valora meets this need with “better-for-you” products in the convenience segment. The legal requirements set the minimum standard, in particular with regard to compliance with the Foodstuffs Act and a certified quality management system. In the tobacco segment, alternatives to traditional tobacco products are offered which expose customers to fewer harmful substances. According to the current state of knowledge, e-cigarettes are less harmful than tobacco cigarettes. Valora has been selling e-cigarettes, nicotine-containing liquids and what is known as “heat not burn” products since 2014. Youth protection is a central concern for tobacco products. Since 1 January 2019, Valora has been applying a voluntary minimum age of 18 to the sale of tobacco products in Switzerland. When nicotine-containing liquids were launched in Switzerland in spring 2018, Valora already applied this age limit to e-cigarettes. Since 1 October 2018, it has repeatedly underlined this commitment by signing the code governing the marketing of electronic vaping devices and liquids. In Germany, nicotine-containing e-smoking products may only be sold legally to consumers aged 18 and over. Valora ensures that youth protection is upheld in practice with regular training courses, technical support for sales staff and mystery shopping spot checks. Valora plans to pay more consideration to healthier products when drawing up plans for its sales outlets in future. Valora is convinced that it is possible to optimally combine these dimensions. Customers should not have to accept any compromises. Valora will therefore focus on these five dimensions in future and integrate the principle of product design even more strongly into its development process. The PETA animal welfare organisation honoured Valora’s subsidiary BackWerk with the Progress AWARD in 2016. 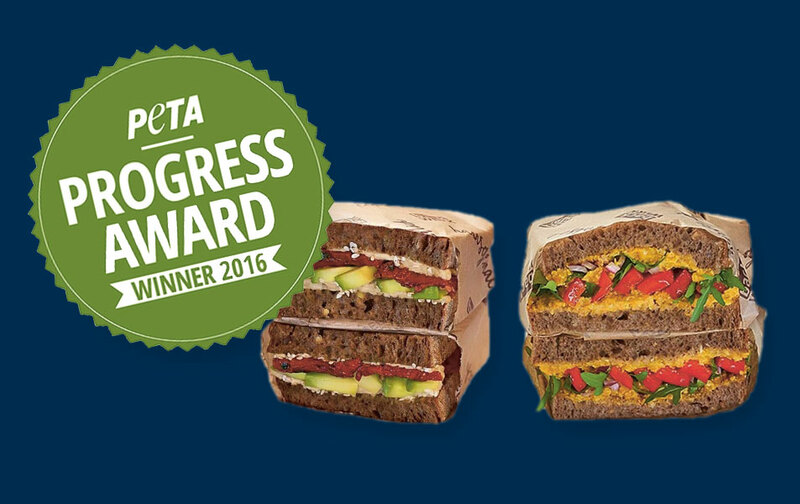 BackWerk received this award for offering the most animal-friendly product range in a self-service bakery. The range of vegan products was expanded even further in 2018, which was notified to its members by PETA. The “Florida summer sandwich” is served with red lentil cream, onion, arugula and paprika. The “Wellness sandwich” is spread with hummus, avocado and dried tomato. Old favourites are also still on the menu, including a vegan chia sandwich, an avocado bagel and a melon cup. Valora has many plans with regard to sustainability for 2019. The strategy will be developed further in cooperation with all business units. During the next step, the material topics will be defined, taking account of Valora’s impact and the expectations of its stakeholders. The contributions that Valora can and should make will then be identified together with the business units. The strategy will define objectives for the different topics and will be reliant on the broad-based collection of data. Reporting standard: Based on the GRI standards. GRI compliance is planned for subsequent reports.